Whenever national elections roll around, our nation has to inevitably endure a certain amount of acrimony, as politicians and parties wage their wars of words. But I don't know of an election cycle that has been as bereft of incivility, and as marked by crudeness as the one we are in. It seems to be reaching a crescendo of vileness, much of which seems to be endorsed by "evangelicals" of our country, just as we should pause to ponder the reconciling and forgiving message of the Cross on Good Friday. But few if any of us are free of missing the mark. We get caught up in unholy attitudes, spouting hurtful words, even letting the political atmosphere influence us more than we should be influencing it. So perhaps we should all be praying, "Father forgive us all, for we know not what we do." In the Midlands of England, in the cathedral of the city of Coventry, stands a powerful witness to the forgiving and reconciling power of Christ. It is one for the world at large, but perhaps even more so our own nation needs to hear it and heed it at this time in our history. 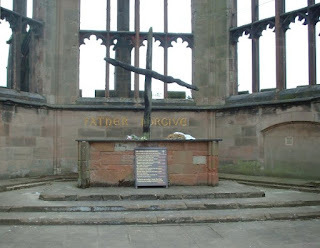 On the night of 14 November, 1940, the city of Coventry was devastated by bombs dropped by the German Luftwaffe. The Cathedral burned with the city, having been hit by a number of incendiary bombs. The decision to rebuild the Cathedral was taken the morning after its destruction. Rebuilding would not be an act of defiance, but rather a sign of faith, trust, and hope for the future of the world. Shortly after the destruction, the Cathedral stonemason noticed that two of the charred roof timbers had fallen in the shape of a cross. He set them up in the ruins where they were later placed on an altar of rubble with moving words 'Father Forgive' inscribed on the Sanctuary wall.The Cathedral was rebuilt, but today the ruins of the old Cathedral are preserved as a memorial and sacred space for the city. It was my good fortune to visit that place once. It was very moving. It would be good if politicians and us common people alike could make that pilgrimage. But that's probably not possible. But it is possible for all us to pause before the Cross this Good Friday, and let its message of forgiveness and reconciliation sink deeply into our lives....and our nation.